The words are by Syrian public intellectual, prolific writer/author and political activist Yassin al-Haj Saleh. They appeared in an essay translated from Arabic for The New York Times and published on April 11, 2011. Still living underground in Damascus since the onset of the Syrian revolution in March last year, Haj Saleh remains without a passport. He will surely miss collecting his Prince Claus Award in December either at the Royal Palace in Amsterdam or at the Dutch embassy in Damascus. The Prince Claus Fund for Culture and Development prize is “actually a tribute to the Syrian people and the Syrian revolution,” said Haj Saleh, a 1961 native of al-Raqqa who was jailed for 16 years, beginning in 1980 when he was a 19-year-old medical student at Aleppo University. He took his final examination as a general medical practitioner in 2000, but never practiced. The Prince Claus Fund was set up in September 1996 as a tribute to Prince Claus's dedication to culture and development. It supports artists, critical thinkers and cultural organizations in spaces where freedom of cultural expression is restricted by conflict, poverty, repression, marginalization or taboos. Annually, the Fund grants 11 Prince Claus Awards to individuals and organizations for their outstanding achievements in the field of culture and development. Four of this year’s 11 Prince Claus laureates are Arab. In his latest published remarks, Haj Saleh was highly critical of British journalist Robert Fisk, Middle East Correspondent for The Independent, who has been taking a lot of flak lately for a series of articles undermining the Syrian insurgency while embedded with the regime of President Bashar al-Assad. 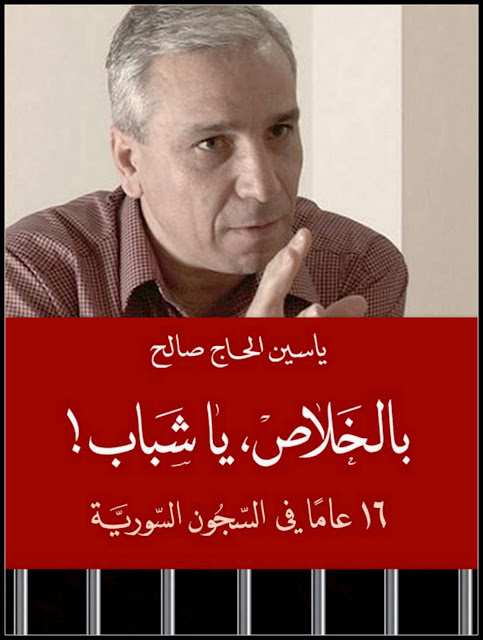 You can read English texts of some of Haj Saleh’s think pieces on the Syrian revolution courtesy of the Free Syrian Translators here. Also, find time to assimilate his masterpiece on Assad’s Shabiha militia for The Heinrich Böll Foundation.